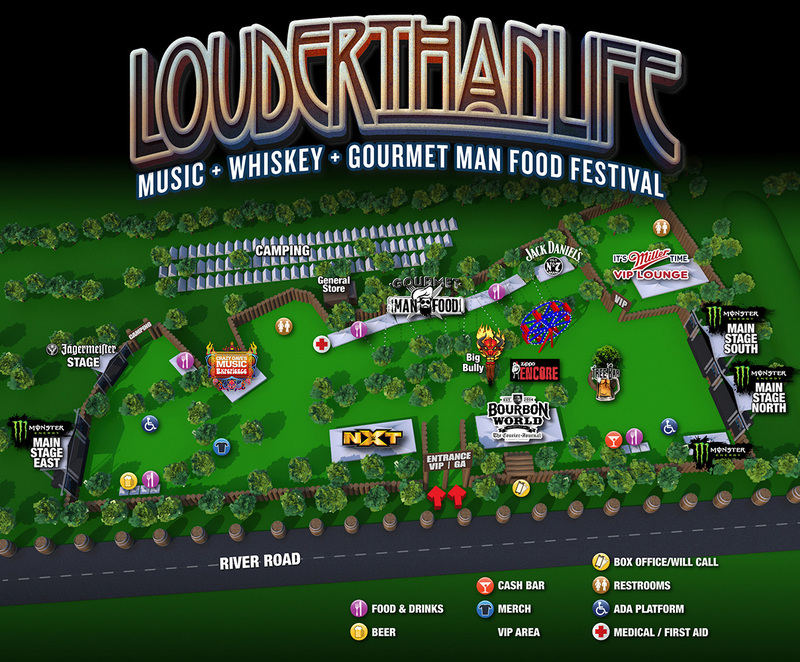 LOUDER THAN LIFE features a selection of award-winning bourbons, whiskey, spirits, craft beer, and Gourmet Man Food curated personally by festival creatorDanny Wimmer, along with a powerful music lineup of rock legends and breaking talent including Rob Zombie, ZZ Top, Godsmack, Shinedown, Lynyrd Skynyrd, Slash featuring Myles Kennedy & The Conspirators, Breaking Benjamin, 3 Doors Down, Bring Me The Horizon, and many more. Bands will perform on four stages, while attendees will enjoy bourbon exhibitions and sampling, along with more than 70 food and beverage vendors that will help celebrate the bourbon culture and culinary heritage of this unique American city. The destination festival will also feature live, in-ring matches with WWE®’s NXT® Superstars, as well as interactive experiences and art installations such as Big Bully, artist autograph signings at the Monster Energy Hospitality Rig, the Monster Energy viewing area with beverage sampling, The Crazy Dave’s Music Experience, Jack Daniel’s Experience, Jäger World, It’s Miller Time VIP Lounge, Zippo Music Experience and more. General admission tickets, VIP tickets, and hotel packages for LOUDER THAN LIFE are available now at www.LouderThanLifeFestival.com. In addition, 2-Day General Admission NO SERVICE FEE tickets are available at The Muhammad Ali Center (144 North 6th Street in Louisville) for $99.50 while supplies last. Ticket discounts are also available for active military through LOUDER THAN LIFE partner GovX.